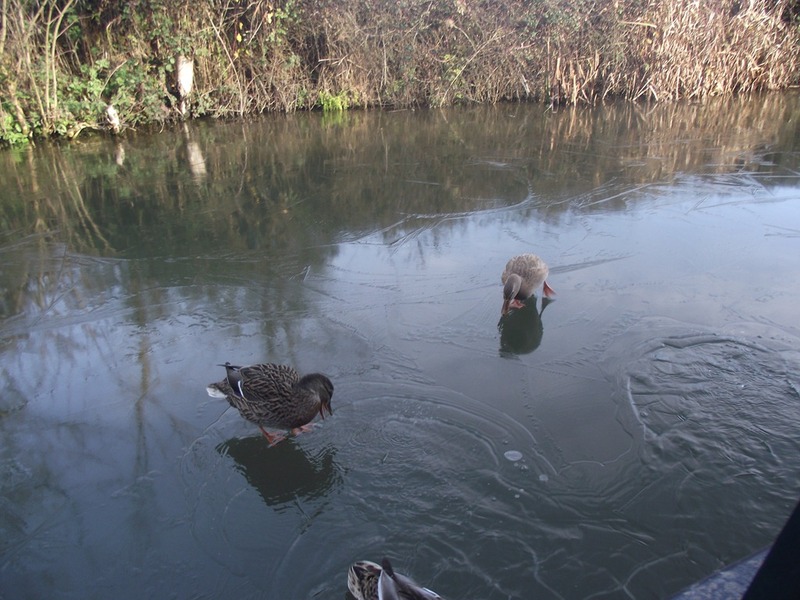 We awoke yesterday morning to find the canal iced over, the sun soon came out however and the ducks were glad to see us when we opened the side-hatch to give them some bread, they flew down the canal towards us, mis-judged their landing and slid straight past the boat. If only I could have captured that shot! 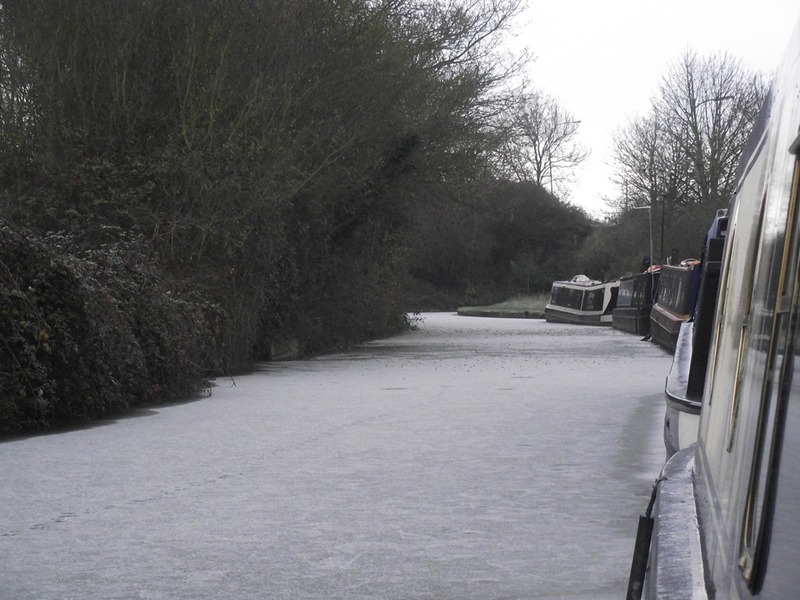 Today was even prettier with a sprinkling of frost or maybe it was snow on top of the ice and a trail of webbed footprints leading down the cut. We weren’t able to snuggle under the cover for too long as we both had ‘Things-to-Do’. 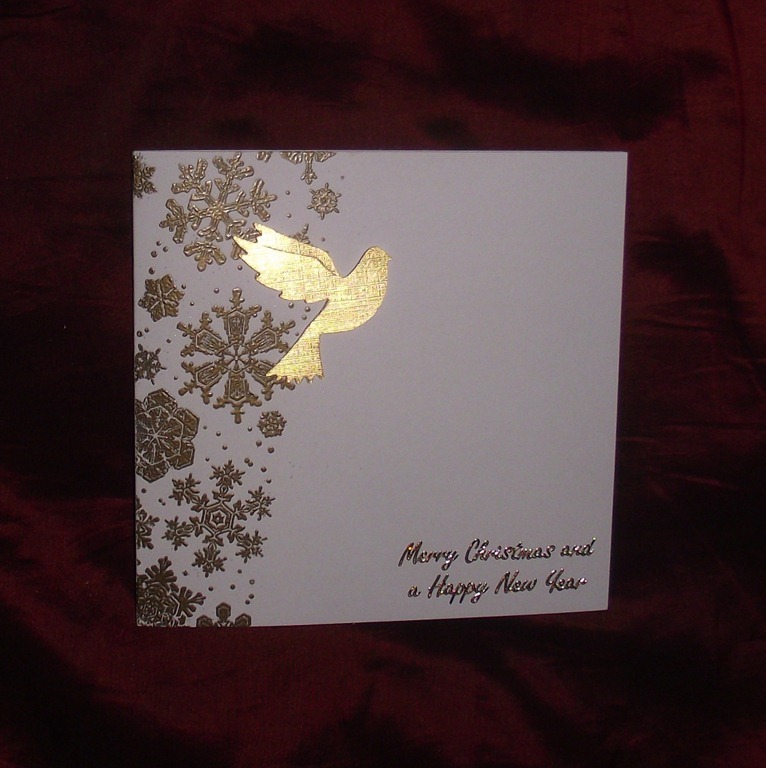 Joy had a Christmas Card Workshop to go to and very impressive the results were too. I had promised to service Maffi’s boat engine so I had to brave the elements as well. Just as I was finishing I was surprised to see one of College Cruisers hire boats coming down breaking the ice. …. but not half as surprised as we were later to hear the sound of approaching bagpipes playing Scotland the Brave and along came another of their boats with some of the crew attired in kilts! Scotland the Brave indeed!!! A little gripe I’ve had about the boat is that there is no lighting when you walk down through the boat so I had an idea, a set of ‘rope’ Christmas lights fixed under the gunwale, but all I could find were 240v versions, surely not too difficult to modify? Then while out buying a bow-saw I found a ‘car’ set reduced to £1.50… Result! 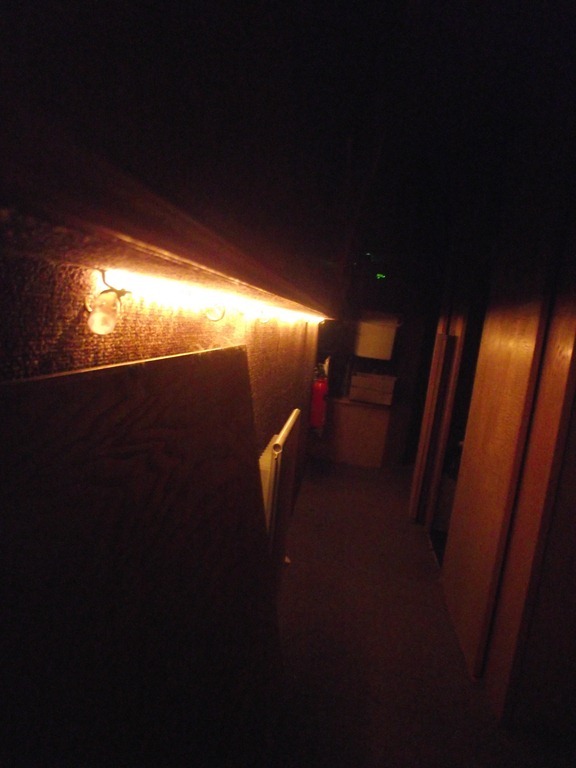 Low Cost, Low Level lighting! The stretch of canal from Heyford down to Thrupp is really quite lovely & we never need much of an excuse to make a trip down there. 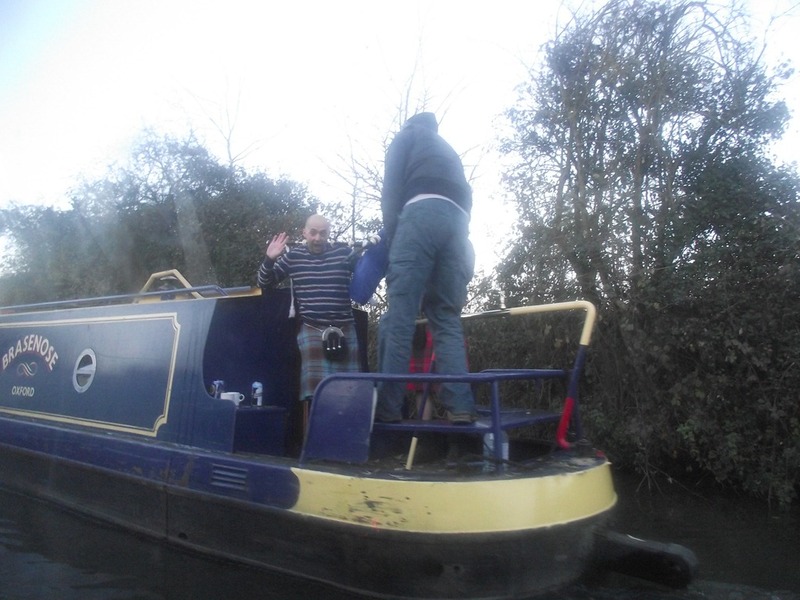 The excuse on this occasion was that Bones had asked me to service her engine and it was clearly going to make life Much Easier by mooring up by the Good Ship Bones. 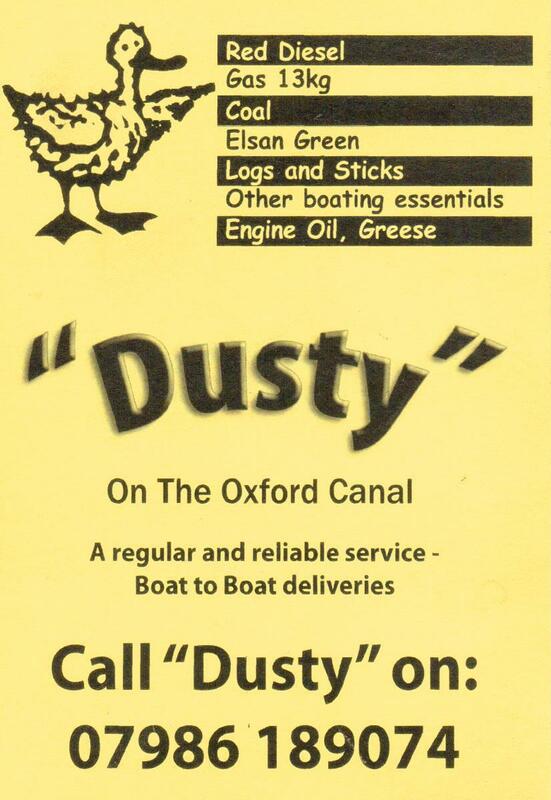 However, before that we had the excitement of purchasing a new chimney from Tooleys in Banbury where we found Paul, an erstwhile colleague from Oxfordshire Narrowboats working. Back at Heyford we also had the pleasure of meeting John & Fi of nb Epiphany who moored up next to us, we shared cups of tea and got to know each other a bit. Since we have been living on the boat it seems so much easier to strike up friendships like this, we wonder it’s sharing a common lifestyle or perhaps it’s just something about boaters! 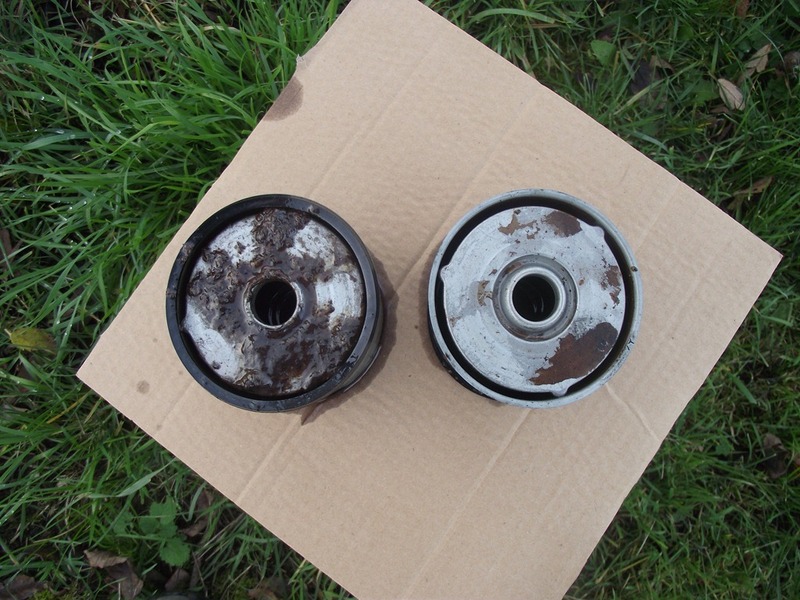 After a recce to check the filters required for Bones’ BMC diesel, they & the oil were obtained and we were good to go! 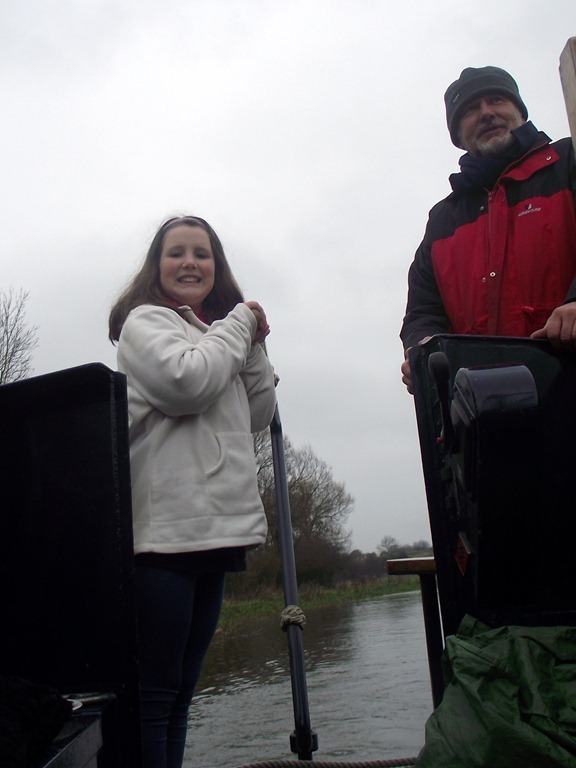 A chance chat to Ian (our ‘vicar’) revealed he was playing rugby on Saturday and Isobel, his youngest, was condemned to freeze on the touchline watching her dad make a fool of himself so Joy suggested she came cruising with us instead. 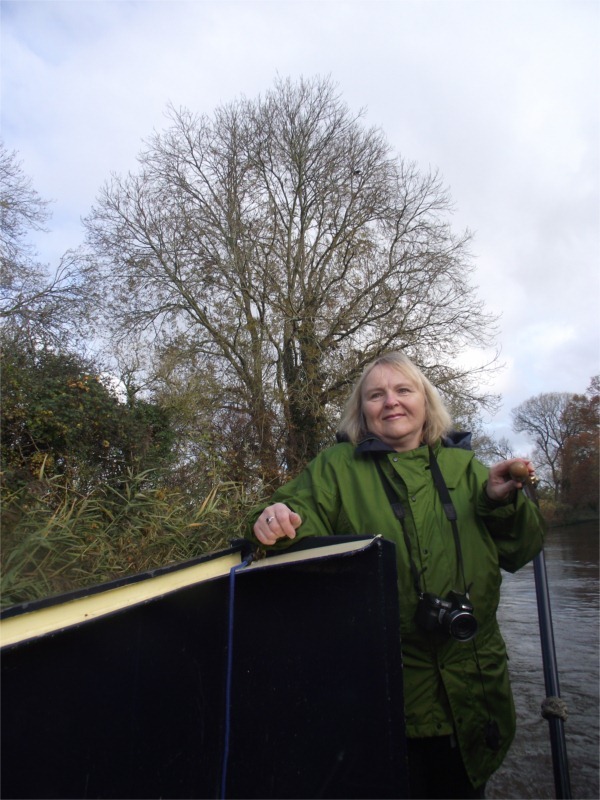 We set off quite early Saturday morning and met Ian & Isobel at Pigeons lock, she was really keen and after lunch took the helm down the section of the River Cherwell between Bakers Lock & Shipton Weir. 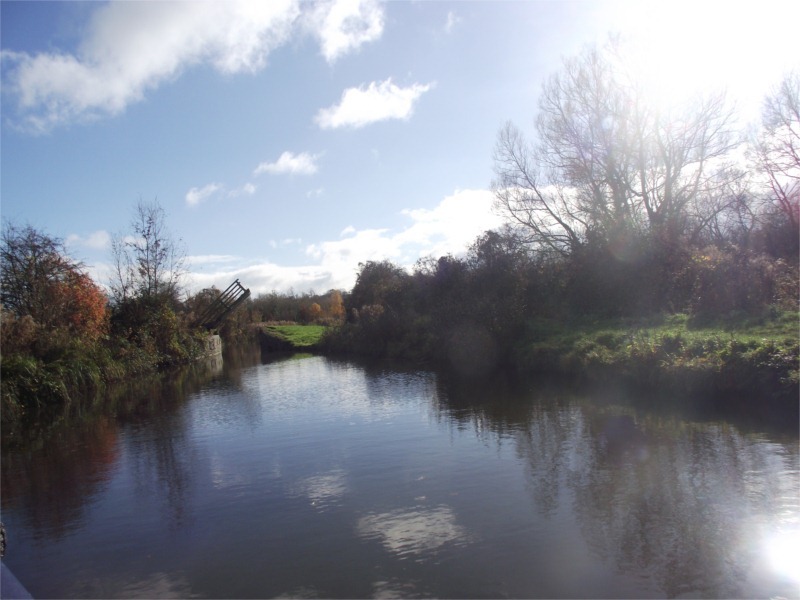 She managed the twists & turns of the river famously and we arrived at Thrupp Canal Cottages to meet up with her dad (weary but victorious) We made the decision to turn before the lift bridge and reverse up this section as the next ‘winding hole’ is miles away. Yesterday we reversed up to the next pub (The Jolly Boatman) where we met up with nb Epiphany again. (not in the pub before you jump to unfounded conclusions) and today we found a space to shoehorn ourselves into next to nb Bones so that I could do the service. Unfortunately the filters were pretty grotty so I think the tank will need some cleaning before too long. Sorry Mort! On Saturday we had a visit from our long-time friends John & Lis Palmer who joined us at lunch time and spent a pleasant afternoon showing them round the neighbouring villages before going to Lower Heyford firework display. 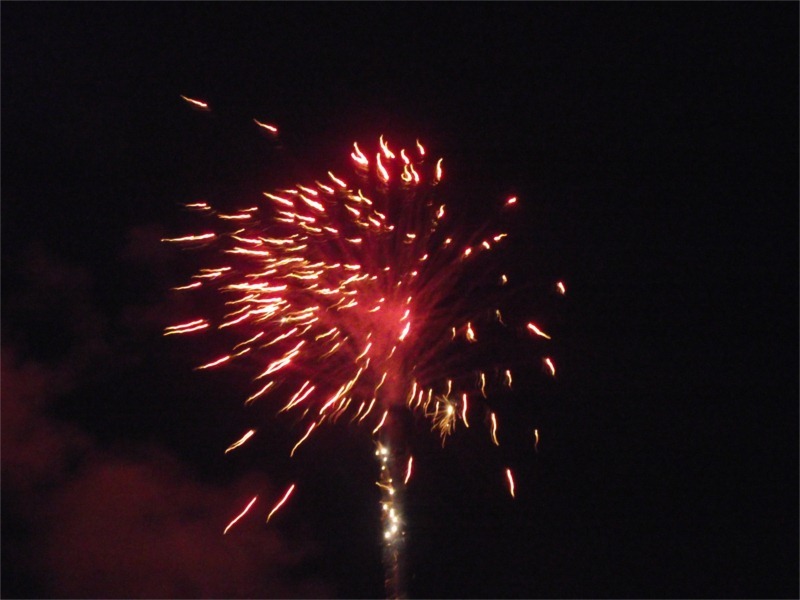 The display was just a short walk down the canal and was very well organised with barbecue & beer/mulled wine tents, not to mention the huge bonfire and the spectacular firework display. It’s nice to live in a village which has a good community and we met up with people we have got to know through work, church and pub! We had bacon butties en-route, stopped at the Rock of Gibraltar for a lunchtime drink and the sun finally appeared and gave us a lovely autumn afternoon. We had our evening meal when we arrived and the evening quickly passed talking about past times with Chris and John (both were R. A. Lister apprentices) swapping tall tales from work and school times. All too soon they had to return home as they had work the next day which was a shame as they would have been a great team-mates for the pub quiz at The Boat Inn later that evening and might have helped us to not to lose! Monday’s forecast was dire but Joy invoked the ‘Rain before 7 –Clear before 11’ rule and we made our way back to Heyford only getting slightly damp, although reversing to Thrupp lift bridge was made interesting by the gusty wind conditions. This afternoon we have Tom Keeling coming to complete our Boat Safety Inspection after Chris carried out the required modifications to fuel lines and some other minor items. STOP PRESS: Hoorah! We passed!